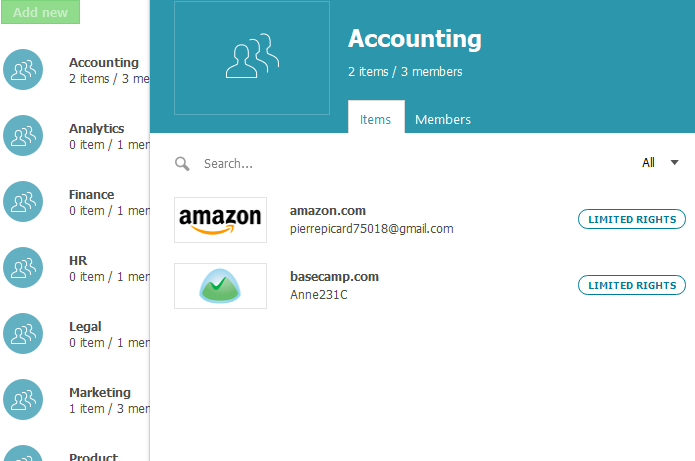 Sharing Groups are an easy and efficient way for users of Dashlane Business plans to share multiple items to multiple users in one instance time. Onboarding employees and ensuring they have the necessary passwords has never been easier. In order to share within groups, you must be a part of a Dashlane Business plan, and your Dashlane Business admin must have created groups while adding you to them. 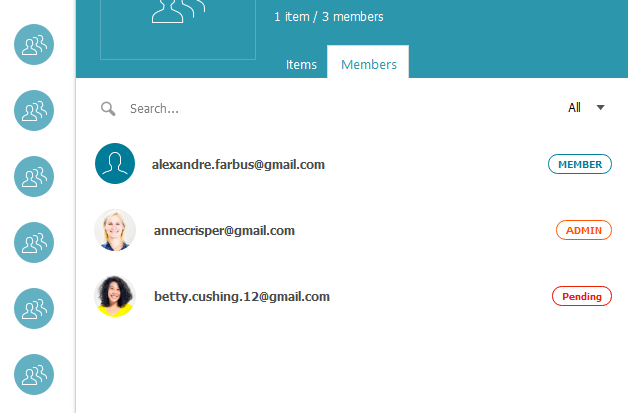 Please refer to this article for an introduction to Group Sharing, and a complete tutorial to creating and managing user groups. There are two ways to share your data with a Group in Dashlane, either directly from the item you want to share or by using the Sharing Center. To share an item with a group, simply locate the item from either the Passwords or Secure Notes sections of your Dashlane app and double-click on the item to reveal the full details. Next, click on the Share icon at the top. Alternatively, you can simply right-click and select Share. Enter the group(s) you want to share with, select the permission settings, and click Next. Please note that you can choose between two permission settings: Full Rights and Limited Rights. Note that when sharing with a group, all members of the group will receive the same permission settings that you pick. Full Rights: The recipient can see, copy, edit, and share the password. Note that the recipient can also edit sharing rights, which includes revoking the shared item of other users who were shared this item, including you. Limited Rights: The recipient can use this password, but cannot securely share or edit it. The recipient cannot modify the password directly within Dashlane, though the password will be updated if Dashlane detects it being changed outside of Dashlane. Within Dashlane, the password is presented as a series of dots, but keep in mind that this hides the password only from a casual or accidental observer. If determined to do so, a technically savvy recipient is able to reveal the password. After an item is shared with a group, all group members will automatically accept and receive the share. The item will be displayed within the sharer's profile in the Sharing Center and live within the Passwords or Secure Notes sections. Note: Sometimes, it may takes a few minutes to the shared item to appear within the group. If you have an issue seeing the item, you must sync or log back in to your Dashlane account to see the update. You will notice that any shared item will have a special icon next to it specifying that this item was shared with one or several other users. After opening the item to view the full details, you can click on the Shared access tab to view the sharing details. You can share Passwords and Secure Notes directly from the Sharing Center. From there, click on the green Add new button at the top of the window. Select the items you want to share and the group(s) you want to share with by manually entering them or clicking the down arrow button to the right. Next, pick the permission settings you want to set for the entire group. Please note that you can choose between two permission settings: Full Rights and Limited Rights. Note that when sharing with a group, all members of the group will receive the same permission settings that you pick. After a Password or Secure Note has been shared with you, you can view the item and your sharing details under the Sharing Center or by viewing the Shared access tab of the item in your Passwords or Secure Notes section. You can manage your shared items in the Sharing Center or by viewing the Shared access tab of the item in your Passwords or Secure Notes sections. To view your permissions and the permissions of others, open the Sharing Center, click on the group you wish to view and locate the item. The permissions you are shown are the permissions that were granted to the group. The sharing details will display the permission settings of every group member who was shared this item, including your own. Items that were shared to a Group will be shown in orange if with Full Rights, or in teal if with Limited Rights. Items that were shared to you will be shown in bold if with Full Rights, or in faint text if with Limited Rights. If an item is shared with you and you delete it from your Dashlane account, the item will not be deleted from its creator's Dashlane account. If you shared something with the incorrect group or you change your mind later, you can revoke access from the Sharing Center. Locate the group you shared the item with, click on the shared item, and then click on Revoke access to stop sharing this item with this group. Additionally, you can locate the item within the Passwords or Secure Notes section. You can only revoke access if you were granted Full Rights over the item. As the credential was shared with the group, if you want to revoke access to a single team member, you must ask your admin to remove this person from the group. If an item was shared with you within a Sharing Group, you will no longer have it on your account if you were removed from the Group. This is because this item was shared and attached to the Group and not with you individually. Moreover, since Sharing Groups are only available for Dashlane Business users, any items on your Dashlane account that were shared using a Sharing Group will be revoked from your account if you are removed from the Business plan. A unique public key saved on Dashlane's servers. When records are shared the recipient's public key is used for encryption (asymmetric). A unique private key which is directly saved in your Dashlane account and encrypted in your Dashlane settings. This is known exclusively by you and never shared or transmitted to others. This private key is used solely to decrypt data. Please note that your private key is different to your Master Password. Your private key is encrypted with your Master Password and stored in the settings of your Dashlane account (along with all of your other saved sensitive data). This private key is synced over to other devices in the same way as your encrypted data is. We never send your Master Password over the internet.